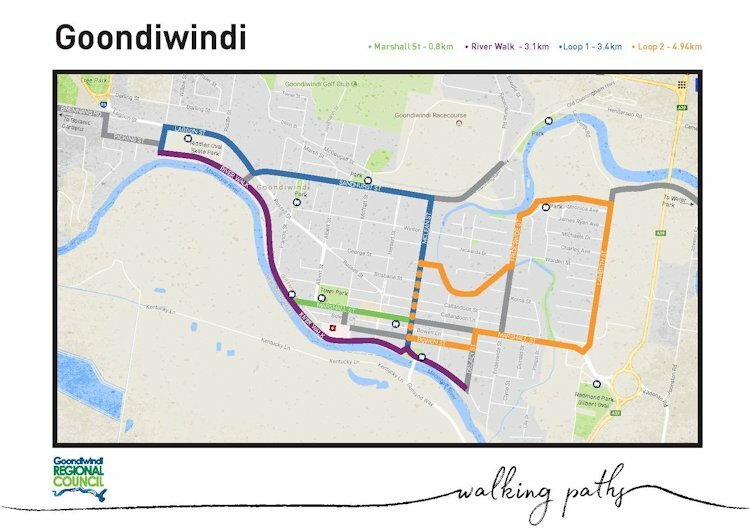 Goondiwindi Regional Council has many great walkways, bikeways and trails winding through its streets and parklands. From the Macintyre River and Macintyre Brook walkways, to the bushland walking trails of the Goondiwindi Natural Heritage & Water Park or Botanical Gardens, there is something to cater for everyone. The Macintyre River 3.0 kilometre Walkway follows the majestic tree-lined Macintyre River, and is a great place to view the prolific birdlife in this area. Along the way you will find points of interest with a series of interpretive signs about the environment, social, economic, historical and cultural aspects of the river, with numerous opportunities to enjoy its natural beauty. For the fitness enthusiasts, exercise stations are located along the walkway at Riddles Oval, McLean Street and Boyle Street. 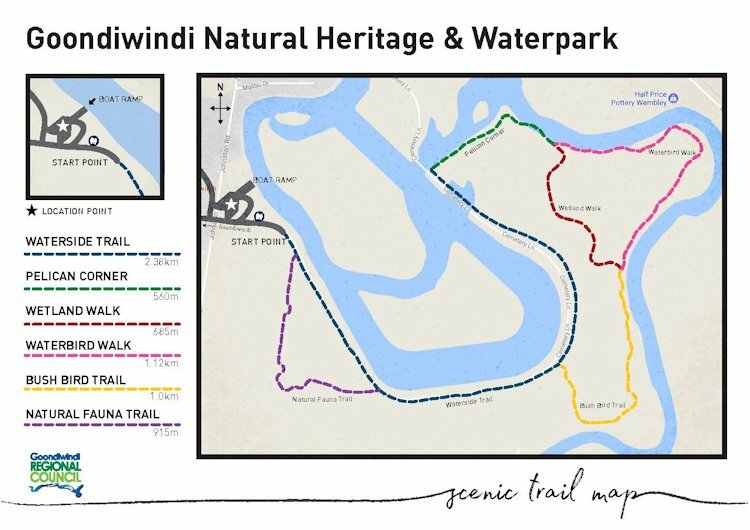 The Goondiwindi Natural Heritage & Water Park Scenic Trail offers the perfect opportunity for people to get closer to their environment with its themed walking trails, purpose built disable access viewing ramp and peaceful seating areas surrounding the 3.3 kilometre water-ski circuit. Blending man-made elements into the wetlands environment, the 6.6 kilometres of scenic walking trails provides the community with a safe place to experience a unique ecosystem. After taking a stroll, all the family can enjoy the nearby barbecue facilities provided, let the kids enjoy the playground or have a game of footy in the beautifully landscaped open space. The Goondiwindi Botanic Gardens of the Western Woodlands is a popular bushland walking trail winding through a 25 hectare area of natural woodlands. The Botanic Gardens entices visitors to explore the diversity of bird life and Australia’s native flora and fauna in the parkland. Following the town’s Olive trees, the Inglewood Olive Walkway takes you on an historical journey with a series of interpretive signs detailing interesting happenings and events in the area, and a monument erected in memory of Alan Cunningham who crossed and named the Macintyre Brook on 30 May 1827. The walkway is split into two section, with a short walk of 1.3km or enjoy the full 2.2km circuit. Texas has a network of walkways linking points of interest and community facilities. 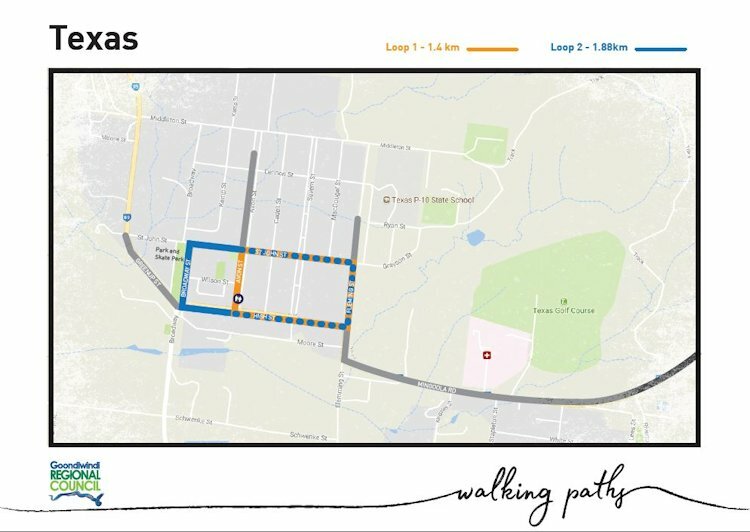 The walkway along Flemming Street and Mingoola Road links the School, Historical Precinct, Hospital, Community Gym and Golf Course. Connected to this from the Flemming /St John Street corner another walkway along St John Street to the Broadway/High Street corner links the local Churches, Medical Centre, Bowls Club, Independent Living Units for Aged, All Abilities Playground, Swimming Pool and the CBD. A walkway along Avon Street to High Street intersects the St John Street walkway linking the Caravan Park and Child Care Centre to the CBD. Dogs must be kept on a leash at all times when using walkways, bikeways and trails. All walking trails are open during daylight hours. Please take note of the opening and closing times on gates in the area.